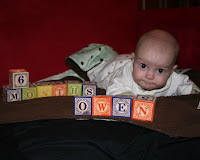 6 months already! I truly can't believe it's been 6 months since I first held mr. itty bitty baby O. We're now zooming our way towards him being a year old and I find myself trying to push the brakes and slow this growing up train down. I finally started sorting through his clothes and packing away the NB sizes that barely fit his head never mind his body. It was a little sad and I'm going to miss a few of those outfits. 6 months in and there a few things that I wish I could go back and do differently. Mostly I wish I had done a better job of capturing and recording those little moments. Blog more! either here or somewhere. I had started out keeping track of O's days in a notebook so that I could transfer it to a baby book, blog or journal type thing later on. The first 3 months are well recorded but after that I started slacking. More photos! I don't take enough pictures of the baby. I have lots but there have been some weeks that I don't take a single photo. The horror! I really try to just enjoy and really be in the moments but I need to do a better job of getting in some "cheese" too. Coming up this week: Mr. O's first taste of real food! I'm going to skip the cereals and give Baby Led Weaning (BLW) a try. I'll let you know how it goes!